Here is the secret way to kill your application’s portability — and by portable, I mean across different computers, let alone operating systems:Â Hardcode all your paths. The above snippet is something I’m battling with to get unit tests working in my project. Naturally it doesn’t work for me because “FOO” isn’t my username nor is my Perforce sandbox “Performance_FOO” because, again, “FOO” isn’t my username. This unit test won’t work across machines using the same OS, and our brethren using Macs or Linux boxes are completely hosed. Don’t hardcode any paths in your application! In Java, use a classpath resource. Â This gives you portability.Â It also allows a Configuration Management team the ability to package all required resources into a single artifact for better version control. The safest way to get a classpath resource would be to use your current classloader to find the resource. // multi-classloader environment. You see this when you write containers of any type. All Collection.contains(obj) methods are not the same! This article is a real world case study of the Big O differences between various implementations of Java’s Collection interface.Â Â I found and fixed a grievous O(n^2) algorithm by using the right data structure. I was asked to investigate why some pages in our web application would save session data very quickly while another problem page would take literally tens of minutes. The application had at its core a Stateful Session Bean that held dirty objects which would be persisted to the database in a single transaction. Sure, the easy pages didn’t contain very much data to persist and we knew the problem page contains many times more data, but certainly not that much more data to cause 20 minute request times! After I implemented the fix, the page elapsed time dropped from 20+ minutes to ~10 seconds. What did I do? I used the right data structure. The application used a Vector to store dirty objects. A Vector was used for two reasons: 1) the original engineers thought synchronization was important and 2) order was important for referential integrity. A Vector’s internal synchronization was unneeded because only a single user’s request thread ever access the application. The ordering, however, was extremely important because you couldn’t add a person’s data without first adding the person! The problem page in the web app had to add thousands of rows of data to the database, hence there were thousands of dirty objects waiting in the cache for persistence. As the application created or dirtied objects, it checked its cache (the Vector) before adding it. You wouldn’t want the data to be persisted twice. The problem with vector.contains(obj) and list.contains(obj) is that they are O(n), which means they scale linearly. Put another way, it gets slower the more items you put into it. The page that created thousands of objects to persist got progressively slower with each object it created. The solution was to switching to a LinkedHashSet which perserves order for referential integrity while providing O(1) performance for set.contains(obj) because all the objects are hashed. The real problem was even worse, of course, because the app checked the cache each time before it added a new object.Â This represents a good ol’ fashioned O(n^2) algorithm. To be fair to the original developers, they wrote the application in Java 1.3 and LinkedHashSet was implemented in 1.4. Also, I don’t think they anticipated having a single page in the application generate thousands of objects. Ever have a stuck or deadlocked thread in a production application? Use JMX to inspect what’s going on inside your JVM, which includes thread views.Â It’ll show you which threads are running, waiting, or blocked and where in the stacktrace they currently are.Â I’ve used this information to find blocked threads in strange places.Â JMX also shows you the memory usage of your java process, including memory consumed by classloaders in permspace. The debug options will open your debug ports, naturally, and let you connect your debugger. Look in your $JAVA_HOME/bin and you’ll see a jconsole executable. That GUI will let you connect to the machine running your java process on the port specified. I hope you find these tips useful.Â Both have been extremely useful to me (as well as adding optional profiling vars to a JVM!). Jason McDonald’s printable design pattern reference cards were printed by DZone as part of their “RefCardz” iniative. You can find Jason’s cards here and you can find other useful design patterns stuff here. Using the batched statement capability of your JDBC driver can give you 7-8X throughput gains. Not only is batching significantly faster, it’ll save database CPU cycles and be easier on the network, too. 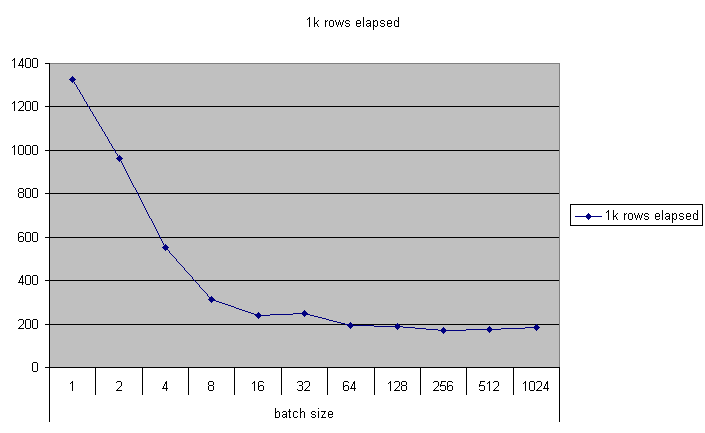 The graph below shows elapsed time (in milliseconds) by batch size. For each data point, 1K rows were inserted into a simple table in MySQL. The benchmarking code I used can be found here. Why is batching so much faster? First, depending on how much PreparedStatement caching your driver is doing, your database may be spending a lot of time parsing and compiling statements. After the statement is parsed and compiled, bind variables are applied. In our example, the data base will parse and compile the statement once as opposed to 1,000 times. This reduces the work your database performs and saves CPU. Second, all bind variables are passed to the database in a single network call instead of 1,000 separate out-of-process, across-the-network calls. This helps reduce network traffic. Third, depending on the internal architecture of your code, single statements may return the connection to a pool after every use. Multiply that by 1,000 and run a profiler and you’ll see yourself calling take/put methods a lot. Many pools also verify the connection on check-in and check-out. “select 1 from dual” is a common check for a pool to use. Your 1,000 uses of a connection may also be incurring the cost of 2,000 “select 1 from dual” statements! When should you use batching? Batching is particularly useful in importing scenarios where you need to get lots of data into your application quickly, but it can be used even when executing a few similar statements. Check out the example source code provided to see if batching is right for you. Fiddle with the numbers to see the gains for batching just 10 similar statements. It may not be 8X big, but trumpeting 25% gains to management is still a win for you and your team. JDBC batching can give you dramatic throughput gains while simultaneously being less abusive to your hardware. Overall, if you have the opportunity to use batch inserts and updates, you should seize that opportunity. Look at your application’s internal architecture to see if batching is right for you. Don’t make me think. That’s how I feel about your code. You’ve reached a whole new level of mastery when you write for simplicity, elegance, and maintainability. This is done on purpose, and it’s hard to get right. Deadlines, schedules, pressure, and stress all encourage us to cut corners and adopt a “Git ‘er done!” mentality. But Abandonment of planning under pressure is one of software’s classic mistakes. It’s a cardinal sin. Designing simple software is hard. It has to be done on purpose. You can’t accidentally find yourself with well-written code and an elegant solution, it has to be written that way on purpose. This admission is a bedrock principle required for designing great software and products. If you can’t admit that simple is Hard Workâ„¢, you haven’t hit rock bottom yet by having to maintain code that would make readers of The Daily WTF blush. Steve Krug’s excellent book “Don’t Make Me Think” is about website usability, yet it changed how I look at my code. Why? Because Steve applied the same principles in his book to his book! And if it works in those two mediums, I thought it just might work for me, too, in my medium (code). “Don’t Make Me Think” is very easily absorbed because he’s feeding you information in a readily accessible way. He wrote it simply on purpose, and I’m certain it took many more hours to edit than it did to write. Simple is hard. Code in plain English. Use an active voice (just like writing). What do you think this method does? Or what about this if statement? Make Stuff Obvious. Quick, what does this line of code do? You can find those convenient date methods here: dates.java (it’s Free software). Use Java 5’s static imports to make the short date seen above. Be Merciless. Be your own worst critic when reviewing your code. Always strive to improve what you’ve written. Just as great essays and novels (and books like “Don’t Make Me Think”) require several rounds of editing, so too does your code. Never nest ternary statements. ’nuff said. Write comments, but be brief and explain why your code does what it does, not how it does it. We already know how it does it, we’re looking at the code. That’s it. Three steps to better code. Putting it into practice won’t be easy, but if you want to be a master of your craft you’ll embrace the challenge and write things simply on purpose. The people who follow you and maintain your code will appreciate it.